Dollar Spot lesions on leaves are a pale, bleached colour. They are bound at either end by a darker reddish-brown band separating the affected tissue from the healthy green tissue. 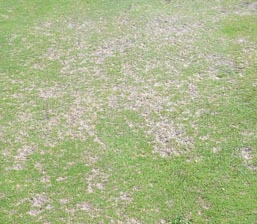 Small (dollar size) spots of bleached turf occur on close mown grass (Plate 1). The spots may coalesce to form large areas of affected turf (Plate 2). White mycelium may be present on affected areas on dewy mornings, which disappear as the leaves dry. Where is Dollar Spot found? Any area of turf, especially golf greens, tees, fairways and bowling greens. In the UK, fescue dominant swards are at high risk of infection. Poa annua grass can also be severely affected. 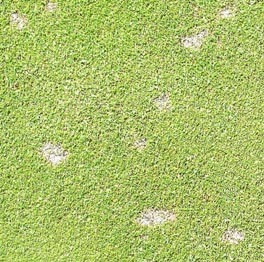 When is Dollar Spot likely to attack turf? The spots reduce the aesthetic appearance of fine turf, such as golf greens and create an uneven surface causing non-uniform ball roll. On longer cut areas, such as tees, playability may not be affected (unless the outbreak is very severe) but the aesthetic appearance will be reduced. Daytime temperatures 20ºC and above. Fescue dominant sward, although there is variation among subspecies and cultivars. Poa annua grass is also susceptible. Dollar spot can be more severe when the sward surface is moist but the underlying soil dry. Therefore, irrigation should be infrequent and to the depth of the rootzone. Air movement over the sward surface should be encouraged. Dollar spot is more prevalent under low fertility, especially nitrogen. Therefore, adequate fertiliser should be applied to prevent low nutrition occurring. Soil compaction and the presence of thatch layers have also been shown to promote dollar spot. Regular aeration will reduce compaction and encourage the removal or breakdown of any thatch layer reducing the potential for severe outbreaks. Once conditions conducive to dollar spot occur, or Greencast indicates high risks of disease a preventative application of Banner Maxx should be applied.